When AeroGrow Inc. released the first model of the AeroGarden way back in 2006, there was nothing quite like it on the market. It was a runaway success and continues to attract new buyers even after more than a decade. If you want to get a simple and hassle-free entryway into hydroponics, the AeroGarden is an excellent choice. But the company has around ten different models in their product portfolio at the moment. How do you know which one is best for you? Well, it is simple really, just check out our AeroGarden Reviews and buyer's guide to know all the important facts about this kit. Hope you have fun! Once you cut through all the marketing spiel, the AeroGarden has a very simple blueprint: it is a container with trays for growing plants, with a lid fitted with grow lights that look a bit like a reading lamp. It allows you to grow simple herbs and vegetables indoors, without having to worry about sunlight. AeroGardens are complete growing kits that come with seed pods, nutrients, and instructions. How Does The AeroGarden Work? Ideally, this thing should have been called a "HydroGarden," as it uses simple hydroponics technique to grow plants without soil. If you must know the difference, aeroponics is another soilless gardening technique that uses fine spray or mist of water to deliver nutrients to the roots. In contrast, hydroponics uses standing or flowing water. And the AeroGarden uses basic hydroponic techniques to grow plants indoors. The smaller systems use a technique called Deep Water Culture, where roots of the plants are submerged in water that is rich in oxygen and nutrients. You add water and the provided nutrient solution to the reservoir at the base. The seed pods go into the slots on the tray above the water. The Aerogarden has to be plugged into a power source, in your home, as it needs electricity to power the lights and the aerator/water pump. Once plugged in, the entire system works in a highly automated fashion. The system takes care of controlling the grow lights, turning them on and off at strict intervals. And when it is time for you to add more nutrients or replace the water, it gives you reminders as well. Modern variants come with advanced features like touchscreen controls, smartphone apps, and WiFi connectivity. What Can I Grow With An AeroGarden? When you buy an AeroGarden kit, you get a selection of seed pods. You can also buy seed pods separately online. The kit also allows you to sprout and grow your collection of seeds. They sell a separate kit for that, called "Grow Anything Kit," which has everything you need to get your seeds up and sprouting inside an AeroGarden. You can also use the AeroGarden as an indoor nursery if you already have an outdoor garden. AeroGrow Inc sells a special Garden Starter Tray, which can be used inside the AeroGarden system to grow up to 65 seedlings. That depends on the size of the model you buy. AeroGardens are available in several sizes. These come with various names like Sprout, Harvest, Bounty, and Classic. The smallest systems can house 3 plants. Bigger versions with 6 and 7 pods are also available. The largest option is the Bounty series, which are capable of growing up to 9 plants simultaneously. Where Can I Grow This AeroGarden Indoors? The only main concern is access to a plug point since the unit requires power all through the day to power the lights and the aerator unit. Does It Require Much Care/Attention? AeroGardens are largely autonomous and automated systems. They do not require constant attention and care. Your jobs are mainly to provide periodic top up of water and nutrients. Also, remember to keep the unit plugged in at all times. The system takes care of everything else, including lighting schedules. It even alerts you when it is time for a water refill. That being said, you can provide some TLC from time to time to improve the output yield of the plants, and keep the system working smoothly. Some routine trimming and cleaning can go a long way. Fortunately, there are very detailed Wiki sources out there, written by seasoned AeroGarden growers, like this one here. Does The AeroGarden Create Any Mess? Since it does not use any soil, the system is very easy to clean and maintain. When dealing with AeroGardens, you do not have to worry about dirt or mud. Pests and insects can be a concern, but that is true for any plant you grow, both outdoors as well as indoors. Bugs and insects can find a way inside, either through open windows, or by hitching a ride on your clothes, or your pets' fur. You can try using homemade organic pesticides or insecticides to get rid of any "unwanted guests." you will have to keep an eye out for such visitors though. Who Should Buy The AeroGarden, And Why? An easy introduction to the world of hydroponics. Does The AeroGarden Have Any Disadvantages? The AeroGarden is aimed at ordinary folk and people who have interest hydroponics. But it does have its limitations. Many serious hydroponic growers would consider the product as overpriced and expensive. This is because you can build a much cheaper DIY system for much less. So if you want to get seriously into hydroponics, building your system is far more economical and rewarding. But if you don't have that kind of time or inclination, AeroGarden was designed specifically for people like you. Grow Height: Adjustable to 24"
The Sprout is the smallest AeroGarden model available out there. So if you have a small apartment, or need a kit that will fit in tight spaces, this is a fantastic option. The downside to that, of course, is that you can only grow three plants at any given point in time. The body of this unit is made of shiny and durable plastic. You have multiple color options like black, red, teal and white to choose from. The system uses 10W LED lights that provide enough energy for growth without adding too much to your electricity bills. You get a herb seed kit that includes parsley, dill, and basil with the unit. User feedback indicates that the system is very easy to use, maintain and clean. It does a great job of growing expensive herbs in your kitchen with minimal running costs. Some users failed to get much growth from the three plants in these kits. Others also complain about faulty and noisy pumps. Grow Height: Adjustable to 12"
The Harvest edition occupies the middle ground in the AeroGarden size charts. This particular unit can grow six separate plants at a time. One of the highlights of this particular model is its stainless steel construction. The metal is durable and also looks far more elegant than the glossy plastic versions. It is available in different finish options, ranging from copper, red steel, and platinum grey. If you want something that can fit your indoor decor, this is a great model from AeroGarden. The Harvest Elite uses LED bulbs like the Sprout, but with a more powerful 20W rating. This is essential to support the extra plants in the unit. The control panel has a display that provides alerts when you have to change the water or add nutrients. True to form, everything else is automated and runs very smoothly indeed. The pod kit provided along with the package includes six pods: Genovese basil, Thai basil, dill, thyme, mint, and parsley. Most users view the latest LED edition of the Harvest Elite as a significant improvement on its predecessors which used CFL lights. The system is very easy to maintain according to most reviews. But one of the most common complaints leveled at this unit is the erratic growth shown by the seeds sold along with the system. Many fail even to sprout. Some users feel that the device is too small to house all six plants when fully grown effectively. This is the advanced variant of the AeroGarden Harvest edition, ideal for folks who want their gardens to connect to smartphones. The main advantage of this unit is the WiFi support. It will send alerts to your smartphone when it is time to add water or nutrients. The system uses a dedicated app that is free to download from the AppStore. Other than that, this is a standard Harvest Unit, with black plastic construction. For reference, standard Aerogarden models have plastic, while Elite denotes the stainless steel versions. You can grow six plants, and the company provides the starter set along with the system. These include the same six gourmet herbs, mint, parsley, dill, and different kinds of basil. Full spectrum LED grow lights enhance the system. These are superior to old CFL technology, as they provide more wholesome light for the plants while still being energy efficient. All AeroGarden units receive high ratings from buyers, and the Harvest WiFi is no different. It has all the hallmarks which have made these units such a success over the years. The main issue with these units seems to be regarding WiFi connectivity, as some pieces simply fail to connect to home networks. The app also needs improvements, according to several users. The AeroGarden Ultra is for folks who want to grow more herbs and veggies in their homes. This is one of the largest models sold by AeroGrow, with the capacity to hold maximum seven plants. This is the standard edition, which comes in durable black plastic. It also gets a larger interactive LCD screen, with advanced controls for scheduling the lights. The LED lights have also been upsized to 30 watts to light up all the plants adequately. The LEDs include both blue and red spectrum lights, which are crucial for plant growth and flowering. Everything else is as you would expect from an AeroGarden. You get a seed kit with gourmet herbs and enough nutrients for one season of cultivation. The Ultra edition has advanced controls, which many users find handy for tweaking the system to their preferences. And they also appreciate the energy efficient performance dished out by those 30 W LEDs. Some users were put off by the excessively bright control panel and its clunky buttons. There is no way to switch off the control panel lights, which can be a significant annoyance at night. Clunky controls need to be improved. The Bounty is for people who need to grow as many plants as they can with an AeroGarden. This is a massive unit, with nine slots for growing plants. The Bounty has several unique features that set it apart from other AeroGarden products. For starters, it gets a shiny feature-packed touchscreen control system, which is one of the best out there on an AeroGarden. The LEDs are massive at 45W, and provide excellent light under which the plants thrive. And the LED arm can be extended, which is a feature which we wish they incorporated into other AeroGarden models as well. This feature allows you give the plants extra room to grow. Otherwise, you would either have to trim them, or transplant them from the AeroGarden once they reach the height of the LEDs. 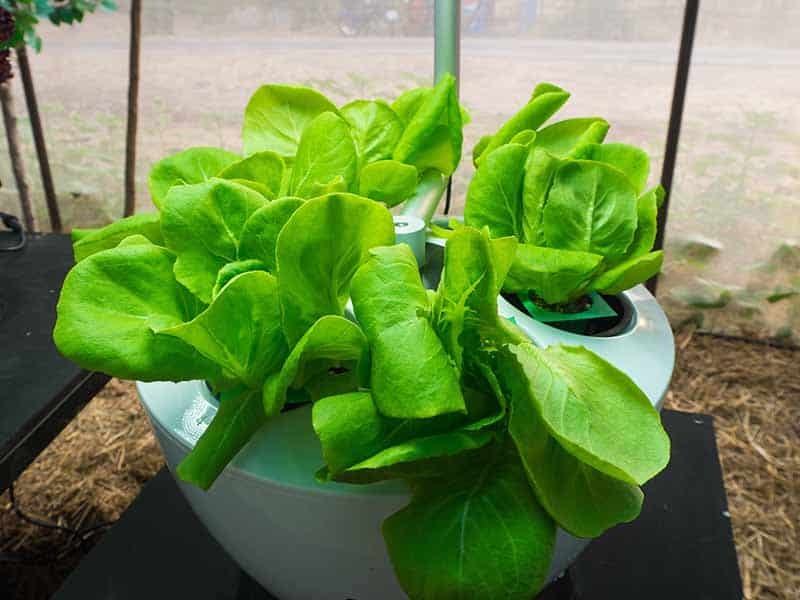 Other features are largely similar to the smaller AeroGarden models, with black plastic body, fully automated system, and free herb pods and nutrients. The Bounty gets high ratings from users due to its ability to grow a lot of plants. Sure it does take up a lot of space compared to the smaller units, but the surplus produce makes up for this in a big way. Negative reviews have the same complaints that most other AeroGarden models receive. Some units have faulty LEDs or control panels, while the pumps on other malfunction after some time. A lot of the features are common across all models of AeroGardens. So ultimately, it all boils down to the plant capacity and advanced features. From this perspective, we feel that the AeroGarden Bounty is the best model out there. That is hardly surprising since this is probably the flagship edition from the company. It has advanced touchscreen controls and an extendable arm. They should incorporate these features into the smaller versions as well. But the Bounty is not for everyone as it is huge. Overall the build quality and performance is uniform across all Aerogarden units, so you can easily base your choice on your budget and size requirements for best results.